View the New Planomatic Tour of 128 Veasey. New Photos and House Plans of the Main Home and Living Quarters of the Boathouse. October sunrise at the "live-in" boathouse at 128 Veasey Shore Road, Meredith, NH. 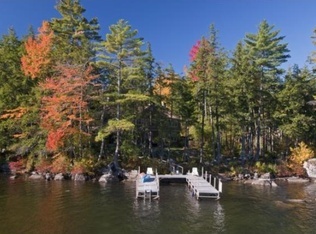 Even in the post peak foliage days, this Meredith waterfront home and boathouse is exquisite. View this Planomatic Tour of this Meredith Winnipesaukee home for sale. The" hour between dog and wolf" comes from the French phrase "entre chien et loup". It refers to a certain time of day that the lighting is shifting, making it difficult to discern between dog and wolf, friend or foe. October itself is a month of shifting, when all the colors of Fall can come and go quickly. When the wind can obliterate the colors overnight and the new day can seem like a new world more than a new month. The excitement in the ever-changing days of October is one of the aspects I love about New Hampshire and Lake Winnipesaukee. A property like 76 Veasey Shore, Meredith NH, which has expansive lake and mountain views and ponds surrounded by gardens and woodlands is a serene world almost unto itself and a perfect spot to enjoy the ever-shifting days of Fall in New Hampshire. 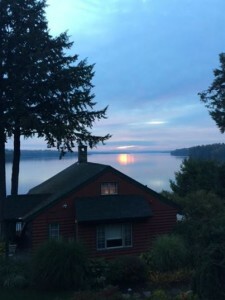 The photos of 76 Veasey Shore taken at twilight, when many trees are already losing their leaves, is a type of moody beauty not always used to market Winnipesaukee Lake Homes for Sale, but the seasons are one of the reasons New Hampshire is magnificent and these photos celebrate it. The elements of New Hampshire celebrate the mystery and potential for change in everything in our world. Come enjoy the beauty of the elements at 76 Veasey Shore on October 12th 11AM-2PM. As a preview, view the twilight photos of 76 Veasey Shore on the 76 Veasey Twilight Photos Link.